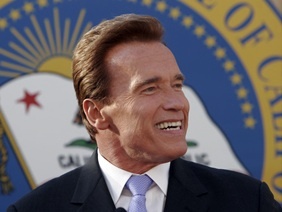 Love him or hate him, California Governor Arnold Schwarzenegger represents large shoes to fill. Particularly from the perspective of companies building clean energy, and energy efficiency technologies — I haven’t seen a governor make as many personal appearances at greentech events, or tout climate change regulation and call for green jobs more than Schwarzenegger. But with the upcoming gubernatorial election in November of this year, Schwarzenegger will be replaced by a leader that will be tasked with shaping one of the most aggressive states in the nation in terms of regulation that promotes clean power and energy efficiency, and is also the home of Silicon Valley’s greentech community. How are the current contenders shaping up in terms of their greentech leanings? At an event at Stanford on Thursday night the advisors of three potential California gubernatorial candidates — Jerry Brown, Steve Poizner and Meg Whitman — weighed in on how their candidates stand on clean power and energy efficiency regulation and the best incentives to spark greentech innovation. Well, they gave it a try anyway. The most clearly-articulated stance on the candidate’s positions was delivered when the moderator asked the advisors — Julia Levin, who represented Brown, Amisha Patel, who represented Whitman, and Ken Stalter, who represented Poizner — how their candidates felt about the state climate change regulation law AB-32. Beyond the advisors’ strong takes on AB-32, the rest of the panel was largely spent on agreeing with each other on points like ‘greentech innovation is good,’ and ‘we need to make California a better place for business.’ There was also a lot of non-answers and apologies, as the advisors hadn’t gotten a chance to yet learn about their candidates position on more specific issues like feed-in tariffs, cap and trade auctions, or specifics in the state renewable portfolio standard. That’s OK — the candidates still have about a month before they have to declare they’re running, and Jerry Brown hasn’t even officially jumped into the race yet. But while much of the positions on climate change regulation were still hazy, expect the candidates to start getting much more vocal and aggressive on their stances over the next few months. Given the overwhelming desire to add jobs in the still weak economy, I would bet that the candidates will take a cue from President Obama and call for many more incentives and policies that will promote greentech firms and green jobs. To fill Schwarzenegger’s footsteps and compete with China’s greentech ambitions (which was a major topic at the event) the candidates are going to have to, to win. If an elected official would request a copy of the Sierra Research SR 2007-04-01 and all communication about the report from CARB, DCA/BAR, IMRC & Sierra Research it might help improve performance of the system.